It's so hard to believe that 20 years ago today, Sweet Praline came into my life. She's been at the bridge for 4 1/2 years, but it just seems like yesterday that she was with me. I know she's up there watching over me and feels as young and healthy as she was when she was gotcha'd. I love you, my sweet diva! Happy 20th Birthday at the Bridge, Sweet Praline. You're always in our hearts. Happy Gotcha Day at the Bridge Angel Sweet Praline. Hugs to mom Paula. Happy Gotcha Day Angel Sweet Praline. We are sending purrs to your Mom in her memory. Happy Gotcha Day at the Bridge Sweet Praline. We know there had to be a big party there for you today. Have the Best Birthday ever and I's hope you get lots of toys and treats!! Rose ~ the adult kitten. What a Bridge pawty you're having Miss Sweet Praline. So many of your friends are there with you now helping you celebrate and also keeping an eye and paw on all of us Mom's who miss our Angels so much. Happy 20th Sweet Praline. Happy Gotcha Day over the Bridge Praline! Happy Gotcha Day at the Bridge beautiful Angel. Such was *such* a beauty!!! I'll bet there's a big party at the Bridge today. Happy gotcha day at the Bridge, Sweet Praline! We love and miss you, dear one. Hey, our Moosey just arrived there. Please tell him we love him, okay? Happy day at da bridge kitteh! 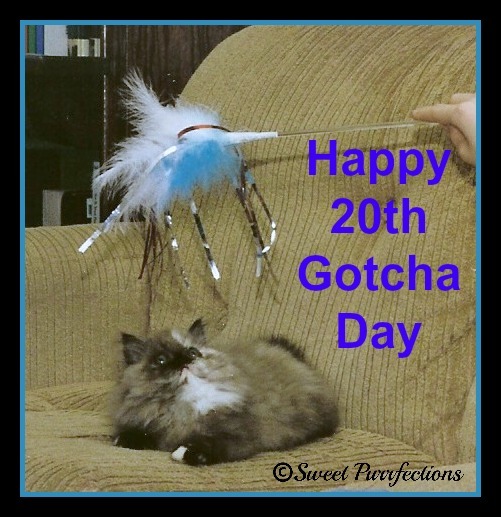 Happy Gotcha Day at the bridge sweet one. Just found your blog and we are so happy to see the beautiful photos of Praline throughout your posts. Thanks for the share. Have a wonderful day.